International manufacturers and suppliers of steel water tanks, rainwater tanks, water reservoirs and tanks, tank liners and more. ACUS manufacture and install Domestic steel water tank for rural blocks and city life, including Grey Water reuse. 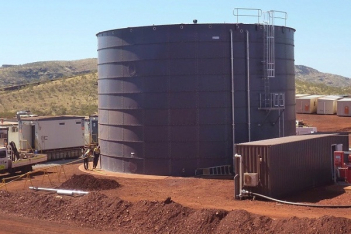 ACUS steel water tanks are the strongest on the market with 1.2mm thick steel walls. ACUS tanks have been around many years and always available to answer your questions. We have an in-house professional Engineers. We manufacture Fire tanks for commercial buildings to your height and diameter. ACUS tanks manufacture and install Commercial tanks for holding large volumes of water or other product compatible with ACUS liners. The ACUS design team can design Large water tanks up to 6,000,000 litres, designed to codes and first principles, to sizes that you require, and quality to suit the job in hand. (Can be dismantled and moved later). ACUS tank liners and membranes for use in both concrete and steel walled tanks. ACUS liners are made to be the best quality for each individual requirement of the tank. Depending on stored liquid and condition of the tank. We also have placed liners in many concrete tanks. We also manufacture and suppliers of pumps and fire water pumps, oil & fuel tanks in welded steel design.